The Manatee Festival at Valentine Park is where all the fun happens. 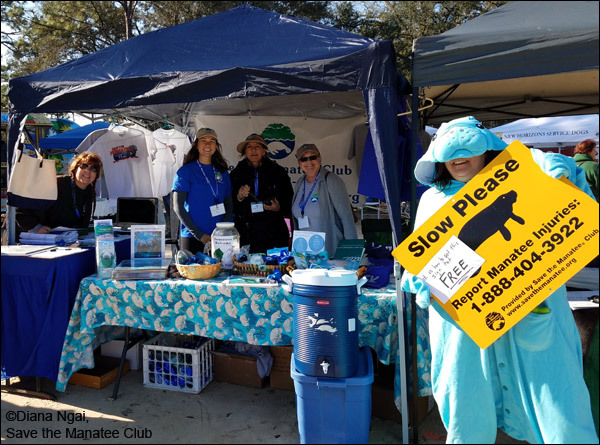 SMC volunteers Karen Ann Bunce, Ally Greco, Melissa Sunshine, Jozette Spina, and Sandra Boyd (dressed as a manatee) are full of energy and ready to welcome visitors to the table. The word has spread among the manatees that Blue Spring is the place to be for the annual festival at the end of January. Over 300 manatees were counted Saturday, January 26th, when the river temperature was down to 59 degrees. The manatees knew there was going to be another change in the weather, but Saturday was relatively pleasant for the humans, albeit a bit on the chilly side. Several of the Save the Manatee Club adoptees were noted in the count as they lazily drifted in the warm 72-degree water of the spring run and were often pointed out to those who recognized them by their unique scar patterns. Annie, with her latest calf, was easily spotted as the day went on. There was an anhinga perched on a branch on the shore for a little while that looked like it was conducting its own manatee count, or possibly counting the humans lined up along the boardwalk! This year’s raffle drawing (where half the proceeds are given back to the park) was a goody basket chock full of many items from Save the Manatee Club’s gift catalog, including a cuddly plush we named Hazel. The drawing for the basket was held at the park at February’s Education Day, and the basket was mailed to the lucky winner. Volunteers Tamara and Tim Carroll talk with festival goers at Blue Spring State Park location where all the manatees are visiting the spring run. As always, when the weather cooperates, Hope, the Club’s large inflatable manatee, presided over the goings-on and posed regally to get her picture taken with visitors. She also kept an eye on the Club’s volunteers as they answered questions and gave out educational materials to the curious public who are always fascinated to learn more about Florida’s gentle giant. Unfortunately, Sunday was a complete washout with rain that started before sunrise and continued until the middle of Sunday night. 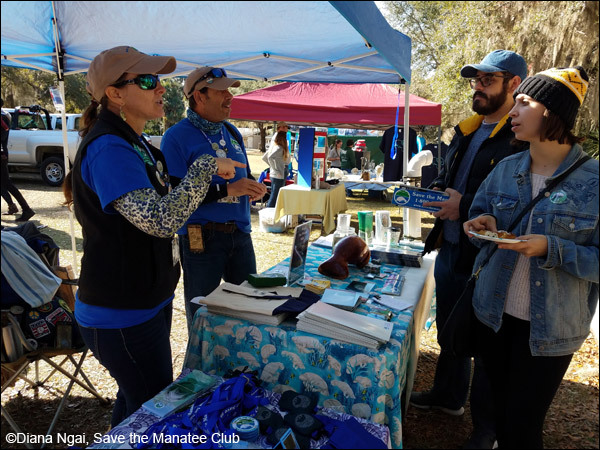 Although Save the Manatee Club’s volunteers were willing to brave the weather, the festival was cancelled at Valentine Park and the rangers at Blue Spring followed suit. It was decided by everyone that the day was better left to the manatees since they don’t mind the rain! The Club’s volunteers met briefly to gather their soggy gazebos and tables and then exchanged materials and hugs for a job well done on Saturday. Cheers to the volunteers! 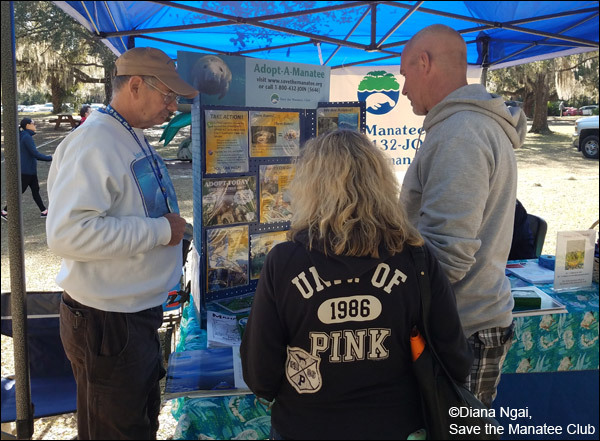 Volunteer Doug Brown meets with visitors who are interested in learning more about how Save the Manatee works to help protect manatees.